Your grapefruits this week come from The Brown Date farm in Coachella Valley, nestled between snow-capped mountains overlooking the Salton Sea, about an hour east of Palm Springs. Their hot days make this grapefruit very sweet and juicy. I eat grapefruit because of the many health benefits, but love this specific fruit because it’s naturally sweet. Cindy Dollar, a local chef is cooking up so amazing organic granola for us. The flavor of July is Walnut Spice Granola. Each month she’s creating a different taste to bring home. Sweet and nutty and oh so delicious! Check it out here in our CSA store and don’t forget to add a dozen eggs laid this week! * you may have received all French beans. If you received yellow beans, they taste best when cooked. See our recipe below. ** if you received a large share you have have received an extra basket of yellow cherry tomatoes instead of red tomatoes. Place the beans in a large bowl with most of the pepitas and tofu cubes (if you’re using them). Toss well with a generous amount of the dressing (you’ll have plenty of leftover), even so, as I mention up above, this is one of those salads that benefits from over-dressing versus under. 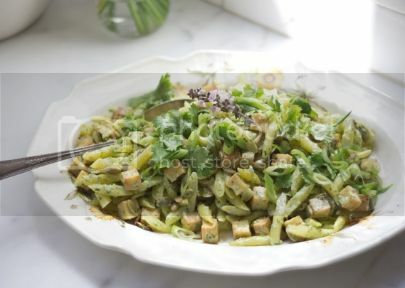 Serve in a bowl or platter topped with the remaining pepitas and tofu, and basil flowers if you happen to have them. 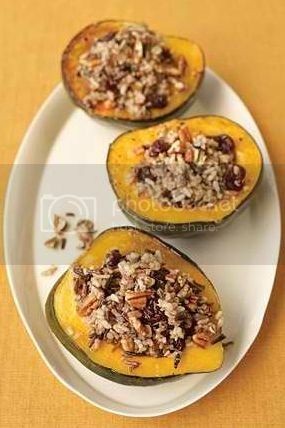 (The acorn squash is one of my favorite winter squashes. Winter squash is actually grown in the summer, but gets its name because it can last a lot of the winter in your cupboard. The acorn squash is a popular one and doesn’t usually last through the winter in our stock. Bring a large pot of lightly salted water to a boil over high heat. Add the pasta and cook until just tender, about 9 minutes, or according to the package instructions. In a large fry pan over medium-high heat, warm 2 Tbs. of the olive oil. Add the garlic and red pepper flakes and cook, stirring constantly, until the garlic is fragrant but not browned, about 1 minute. Add the greens and stir to coat evenly with the oil. (If they don’t all fit at once, add in handfuls after allowing the first batch to wilt.) Cook, stirring occasionally, until the greens are tender, about 5 minutes, adding a few tablespoons of the pasta cooking water to the pan if needed to prevent sticking. Drain the pasta and return it to the warm pot. Add the cooked greens, cheese, the 1/4 tsp. salt and the remaining 2 Tbs. olive oil and stir to mix well. 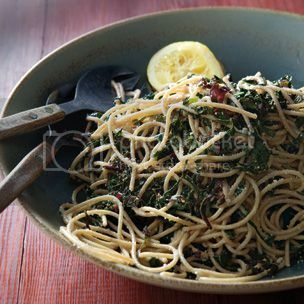 Divide evenly among pasta plates or bowls and serve immediately. Pass lemon wedges at the table. 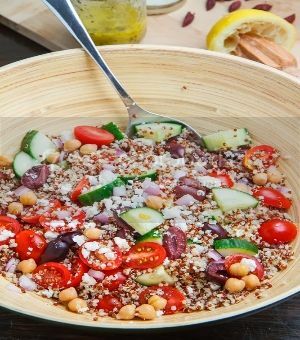 1.Bring the quinoa and water to a boil, reduce the temperature to medium-low and simmer, covered, until the liquid has been absorbed, about 15 minutes, and let sit covered for 5 minutes before letting it cool. 2.Meanwhile, prepare the remaining ingredients. Ok, so maybe apricots aren’t a hot juicing item. But they are dang good so you are getting them!! This entry was posted in Uncategorized on June 30, 2014 by Carolyn. Your apricots come from Vincent Farms right here in Goleta. Each apricot has been hand picked and selected for our CSA by the Vincent family. Their usual practice on the trees is called dry farming. This is the first in 20+ years that they’ve ever had to run drip lines out for the trees to supply water. As a result the apricots are smaller than usual, but pack a ton of flavor. Enjoy!! This entry was posted in Uncategorized on June 24, 2014 by Carolyn. We had a great weekend here on the farm. We had the opportunity to throw a party for our farm workers. We buried a pig underground and feasted Saturday with all the guys. I also had to wake up and work one of the 8 farmers markets that went out on Sunday – along with making sure the chicken flock was happy and well kept. I’m a little behind to say the least. Here’s the contents of your box this week. More recipe suggestions to come, but I wanted you to know what’s on the way. In a large, deep skillet, heat 2 tablespoons of the olive oil. Add the broccoli, cut side down, cover and cook over moderate heat until richly browned on the bottom, about 8 minutes. Add the water, cover and cook until the broccoli is just tender and the water has evaporated, about 7 minutes. Add the remaining 1 tablespoon of olive oil along with the garlic and the crushed red pepper and cook uncovered until the garlic is golden brown, about 3 minutes. Season the broccoli with salt and black pepper, drizzle with the lemon juice and serve. 1.Bring a large pot of water to a boil. Add a generous pinch of salt and cook noodles according to package directions. Drain and set aside. 2.Add butter, shredded squash and a pinch of salt to the pan and sauté over medium heat for 4-5 minutes or until squash has softened. Add the flour and sauté another minute. 3.Reduce heat to medium-low, pour in milk and stir regularly until milk is steaming and has thickened a little. Remove the pot from heat, add a small pinch of salt and stir in the cheese. 4.Continue stirring until cheese has melted, then add the noodles back to the pot and stir gently until ingredients are well-incorporated. This entry was posted in Uncategorized on June 16, 2014 by Carolyn. This entry was posted in Uncategorized on June 9, 2014 by Carolyn. We are selling local Goleta granola and the flavor of June is Gluten Free Seed and Coconut. Check out the CSA store for a list of ingredients. When you buy this granola you are supporting a local family, not to mention its some of the tastiest granola around. I had a chance to visit Vincent farms this week to get a glimpse of their ripening apricots. While their apricots are still a few weeks out, I stumbled on some ripe peach and orange trees. Keep an eye out for Vincent’s fruit picked ripe only for our CSA boxes. They only have a few trees so we only could put them in the LARGE shares. The difference between the fruit you find in your boxes and the fruit in the grocery store, which is picked unripe so it can sit on the shelf, is that the fruit in your box was picked ripe for maximum flavor and nutrients. 1.Steam kale until slightly wilted. Drain, cool slightly, and finely chop. 2.Meanwhile, mix horseradish, shallot, pepper and salt in a large bowl. Add the chopped kale and potatoes; stir to combine. 3.Heat oil in a large nonstick skillet over medium heat. 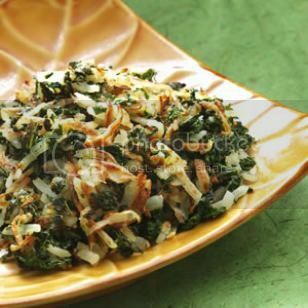 Add the kale mixture, spread into an even layer and cook, stirring every 3 to 4 minutes and returning the mixture to an even layer, until the potatoes begin to turn golden brown and crisp, 12 to 15 minutes total. Tips & Notes Tip: A 1- to 1 1/2-pound bunch of kale yields 16 to 24 cups of chopped leaves. When preparing kale for these recipes, remove the tough ribs, chop or tear the kale as directed, then wash it–allowing some water to cling to the leaves. The moisture helps steam the kale during the first stages of cooking. Ingredient Note: Boil potatoes until they can just be pierced with a fork but are not completely tender. Let cool slightly, then shred. Chop the basil and garlic. 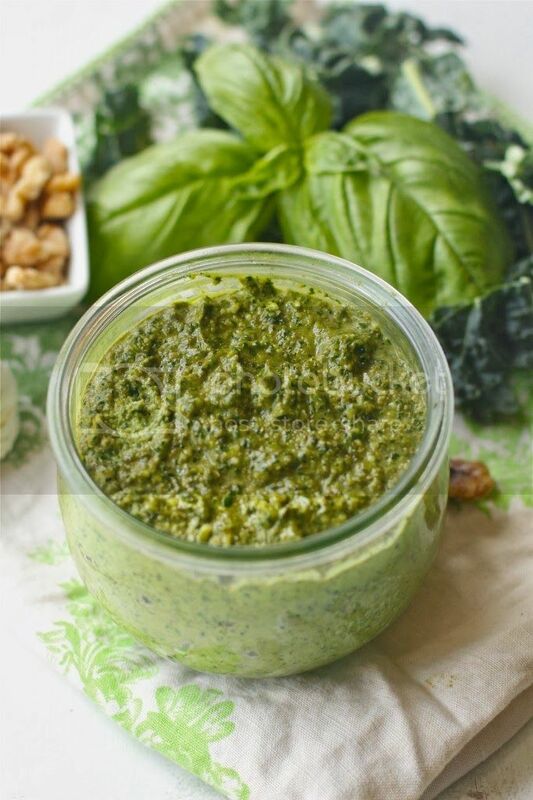 In a blender, add in the basil, garlic and 2 cups of kale in a blender. Turn the blender on and then slowly pour in half a cup of the olive oil. If you see it’s not blending, turn off the blender and scrap the sides down making sure the oil makes it’s way to the bottom and then begin blending again. Bring a large pot of salted water to a boil and cook pasta according to package directions. Drain well and set aside. Heat oil in a large sauté pan over medium-high heat. Add garlic and squash and sauté 3 to 5 minutes or until just tender. Remove from heat and stir in tomatoes. 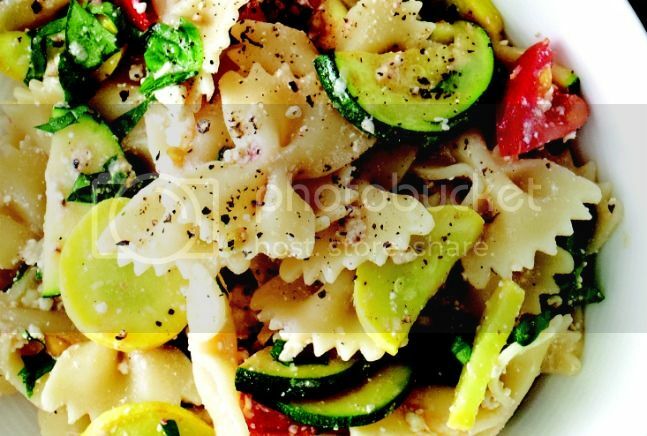 In a large bowl, combine cooked squash and tomatoes with pasta, basil, cheese, salt and pepper and toss well to combine. Serve warm or refrigerate until cool and serve chilled. 1.To remove some of the bitterness/spiciness from the onions, place the onion slices in a bowl, sprinkle about ½ tablespoon of salt over the onions. Rub the salt in and then cover with water for a few minutes. Then drain and rinse the onions well. 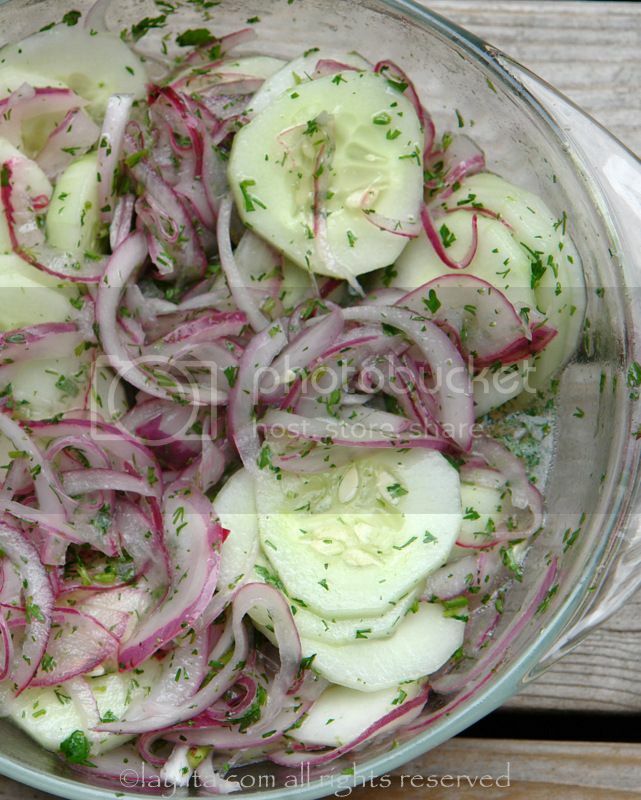 2.Place the sliced cucumbers, sliced onions, lime juice, chopped cilantro, and olive oil in a bowl. 3.Mix well, taste and add salt as needed. 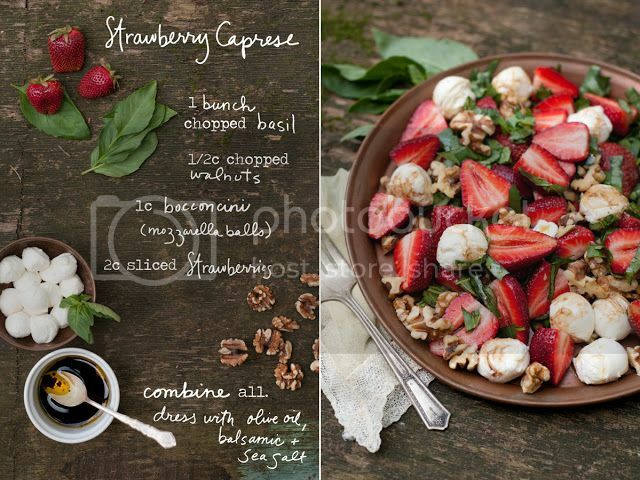 4.Serve immediately or let rest refrigerated for at least 30 minutes before serving. This entry was posted in Uncategorized on June 2, 2014 by Carolyn.